Welsh leaders urged to halt ‘nuclear mud’ dumping off Cardiff, Sediment from Hinkley Point C construction site is being disposed of at Cardiff Grounds, Guardian, Steven Morris @stevenmorris20– 2 Oct 2018 Pressure is increasing on the Labour-led Welsh government to halt the dumping of “nuclear mud” in the sea close to Cardiff after a campaign by an eclectic group of scientists, surfers and a pop star. A motion calling on the government to suspend the licence allowing mud excavated from the construction site of the Hinkley Point C nuclear power station in Somerset to be disposed of just off the Welsh capital is to be debated next week in the national assembly for Wales. The development prompted Cian Ciarán, the keyboard player from Super Furry Animals, to discontinue an attempt on Tuesday to obtain a court injunction to stop the dumping. 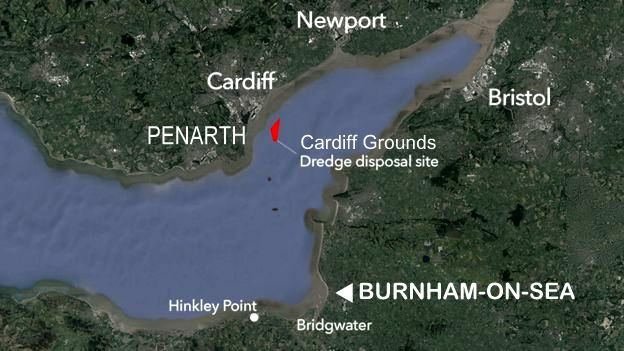 There is growing concern and anger that 300,000 tonnes of sediment from the Hinkley Point C site is being disposed of at the Cardiff Grounds sandbank. Campaigners claim the mud has not been tested properly and could contain particles that may pose a health risk. They have described the sediment as “nuclear mud” and nicknamed the sea off Cardiff “Geiger Bay”, a play on Tiger Bay, the old slang name for the city’s docklands. One of their main concerns is that the sediment could be washed ashore in a storm. He called for the Welsh government’s patrol vessel, FPV Rhodri Morgan, to monitor the dumping that is taking place. “It is a duty for every Welsh assembly member to do right by its people and hold to account the government that granted the licence,” he said.